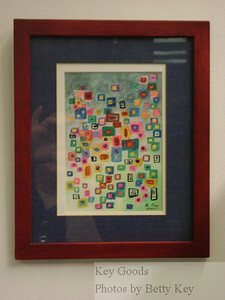 These are photos from the UMB Art@Work, Creativity from the Cube Exhibit - well all except the cat in the stone wall. 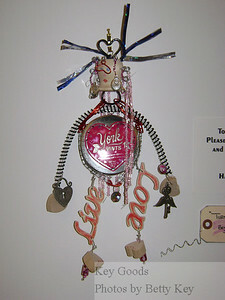 "Turn Me On Love Child" - A found object piece that I made this month. If you use your thumb and forefinger to squeeze her from the back and the front of the candy tin, she'll "turn on" and a bright light will shine through tiny holes that I've drilled in the tin around the heart shape. 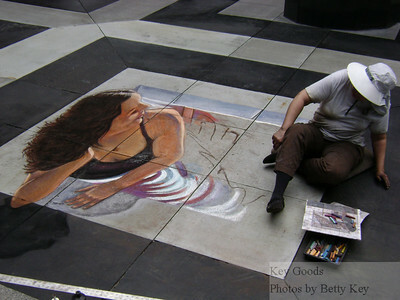 She is for sale for $60, contact Betty Key through betty@blueandgrey.com until I can get her posted on-line somewhere. "Turn Me On Love Child" - photo taken at the UMB Art Week without a flash. "See the Light" - photo taken at the UMB Art Week Show. 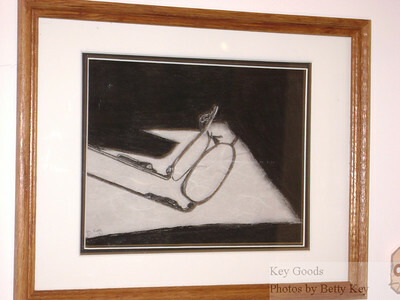 This is a pencil and charcoal drawing that I did from a photograph that I took one day at work when the sun was streaming in from the window above - and this patch of bright light was forming the shadow of my reading glasses on my cubicle desk. The drawing is on a paper that is printed to look like a handmade paper that I thought simulated the speckle of my desk. 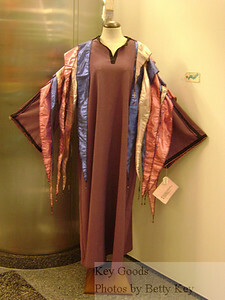 "Wild Wizard" Robe - photo taken at the UMB Art Week Show. I made this robe from a purple & black crepe type fabric that I had. 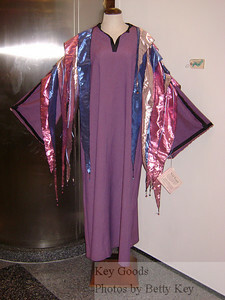 The fancy lame' & bead & ribbon streamer sections are attached to a velcro piece edged with purple piping that attaches to the robe with velcro. This is so the robe can be washed. The fancy pieces can only be spot cleaned by hand. This is also for sale, but I'll have to post additional details later. "Wild Wizard" without a flash at the UMB Art Week Show - see previous photo for more details. "Modern Quilt" - photo taken at the UMB Art Week Show. This is a watercolor piece that I did a couple years ago. It is for sale, but I'll have to post the details later. 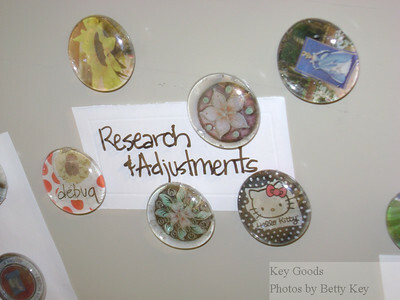 The group of "glass bubble" magnets submitted for the "One UMB Art Project" that encouraged all associates to be creative. 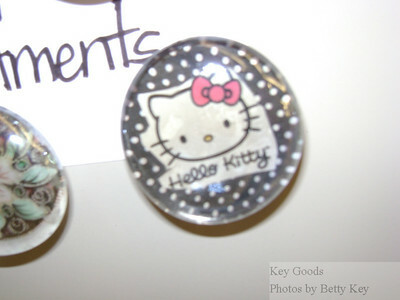 The magnets were sold at the end of art week with the proceeds benefiting the artskc.com fund. 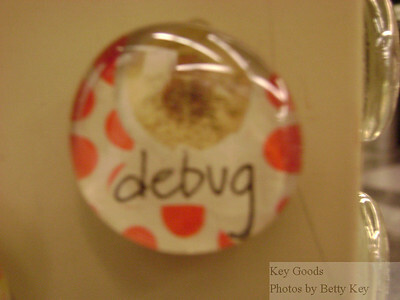 This is the "glass bubble" magnet that Mary Ann did. I thought it was pretty cute! 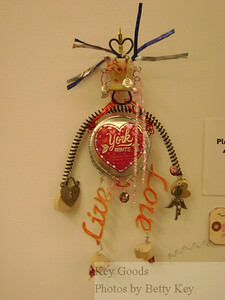 The magnet project was the "One UMB Art Project" that encouraged all associates to be creative. 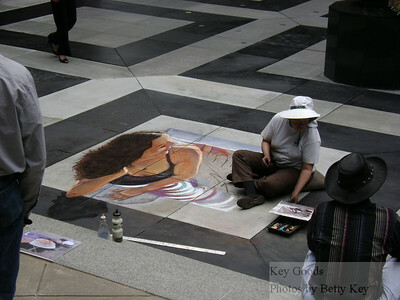 The magnets were sold at the end of art week with the proceeds benefiting the artskc.com fund. 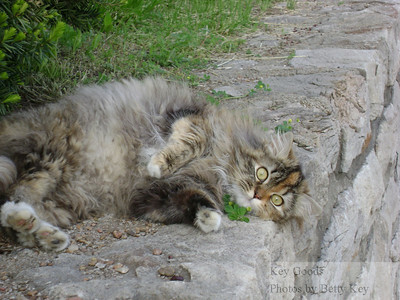 This is Cali Cat - a beautiful, but wild, calico cat - that lives in Independence by the Blue & Grey Book Shoppe. I am too much of a softie and put out food for her. She lives under the porch of the house next door. She has nothing to do with the UMB Art Week, but I wanted to share her. I recently got a better photo of her - I just thought this one was so funny because she practically blends in with the stone wall.